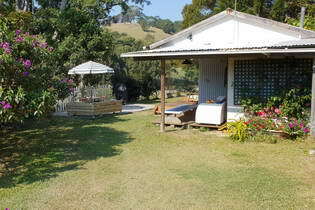 Boutique, heritage, historic, unusual and unique accommodation in the Byron Bay, Tweed Valley, Gold Coast Region of New South Wales and Queensland, Australia. There's something different about it. From restored historic and heritage houses with themed guest suites, to quirky cottages and environmentally friendly lodgings, these unusual properties have unique features which will delight and endear. Whether it's old style elegance you're looking for, or laid back and funky accomodation, or maybe just an unusual and offbeat place to stay, it's probably here. Tariff is indicative only (per night/off peak). Just 13 private architect-designed luxury bungalows, all with fireplaces, double spa baths and rainforest views, are placed discreetly in a spectacularly pristine Australian rainforest. From AUD $375 p.n. to $655 p.n. midweek, 2 night min. Surrounded by nature on 6 private acres of lush greenery, Fig Tree Retro Studio is ideal for a couple or solo adventurer, looking for a secluded location, but still just 5 minutes drive to Pottsville Beach. Featuring recycled timbers and comfy retro style furnishings, it's fully self-contained with a kitchenette and queen bed, ceiling fans, electric heater, an outdoor deck, and a garden area. Bed and bath linen is provided, along with a complimentary "Welcome Hamper" filled with breakfast goodies. From $95 pn, 2 night min. Set on 113 acres of beautiful forest, SummerHills Retreat offers luxurious self-contained accommodation with spa baths, a saltwater pool, a yoga room and a swimming pool. 24-hour reception, massage services, and yoga sessions with a professional instructor are also available. A luxury hotel and fine dining restaurant housed in a historic building Ballina Manor has 12 rooms, all with an en-suite bathroom and access to a shared or private balcony. Choice of double rooms, or king room with spa bath. Dine in luxury in the à la carte Manor Restaurant open every evening. Surrounded by 4 acres of beautiful gardens, Victoria's offers luxury air-conditioned accommodation with free Wi-Fi, a TV and DVD player. The rooms are elegantly decorated, and have a private bathroom, most feature a spa bath, and some also include a balcony. Optional breakfast available. This 2-storey Scottish Castle offers luxurious apartments with a private plunge pool and a balcony offering lovely views. Each apartment has antique furnishings, a four-poster bed and a deluxe bathroom with a spa bath, lounge, a fully equipped kitchen and laundry facilities. Set at the base of Mount Warning and surrounded by lush forests and lakes, there are just 3 couples only uniquely themed lodges, each with hand-crafted furnishings, a fully equipped kitchen and original artworks. All have a fireplace, patio or balcony, and a private hot tub. Home-cooked meals are available for delivery. Nestled on Tamborine Mountain and situated opposite Witches Falls, this private adults-only retreat offers 6 self catering and individually themed cottages with 2-person spa baths, log fireplaces and free Wi-Fi. 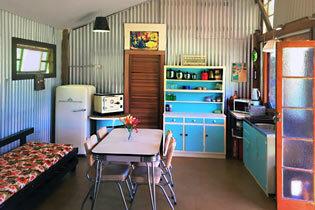 Each cottage includes air conditioning and a fully self-contained kitchen.